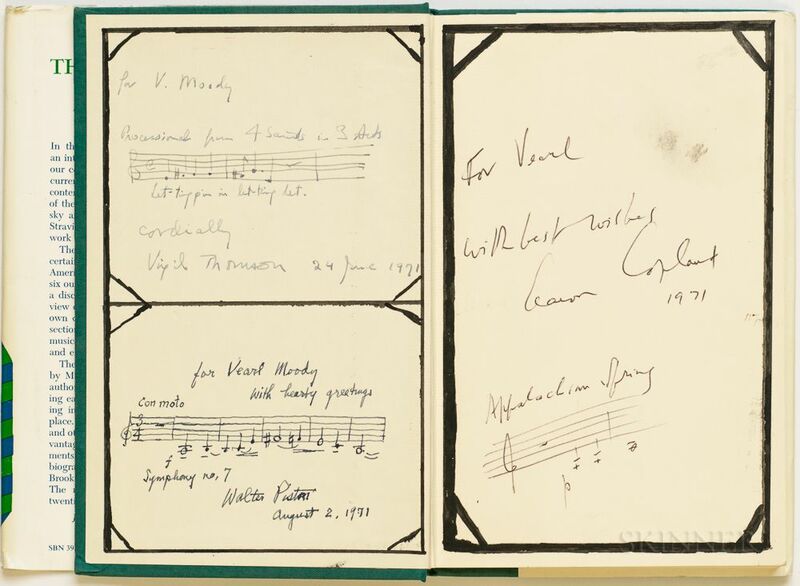 Aaron Copland (1900-1990) The New Music, Signed by Copland, Walter Piston (1894-1976) and Virgil Thomson (1896-1989). New York: Norton, . 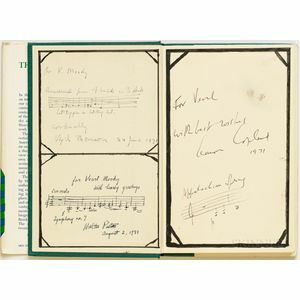 Octavo, later edition in a price-clipped dust jacket, signed twice by Copland: on the ffep with a musical quote from "Appalachian Spring" dated 1971, and again on verso of half-title in 1981; Thomson and Piston's signatures with musical quotes on pastedowns, both dated 1971, both with musical quotations; all the three inscriptions from 1971 dedicated to Vearl Moody, 7 3/4 x 4 3/4 in.